The Glocknerman Sprint ist for the beginners of ultra cycling. 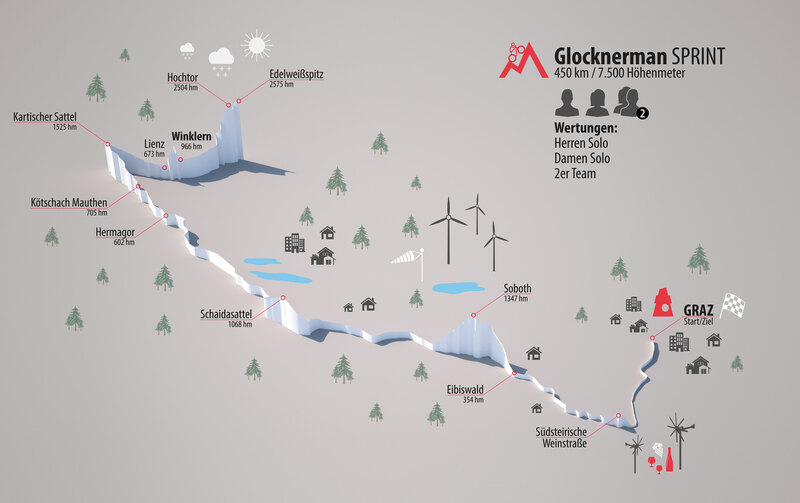 With 450km and 7.500 vertical meters is the race in kind of a special 24 hour race with start in Graz and finish at the highest mountain of Austria - the Großglockner. The sprint also requires a pace car with at least two driving people. If in an age division are less than participants the age rating is combined with the next lower. Pure Encapsulations® has been producing high-quality pure substances for more than 25 years and is thus the original for pure micronutrients. The comprehensive product assortment of maximum tolerable monopreparations and balanced nutrient combinations is successfully used worldwide in therapy and prevention. Free of lactose, fructose, gluten as well as conventional additives, the pure substances are also suitable for sensitive people, allergic persons and persons who suffer from incompatibilities. In addition to the high-quality products, the expert advice on purchasing in the pharmacy is as much a part of the quality as well as informative articles on the Healthy Life Blog or tips and tricks on the social media channels - the original does not exist a second time.